2015 is set to be a big year for smartwatches and that's thanks mainly to the Apple Watch, a device which could finally make wearables mainstream once it releases on April 24, with pre-orders going live on April 10. 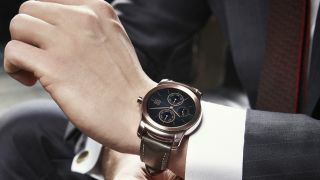 But while the iWatch will almost certainly be a success it's not the only smartwatch launching this year and LG has already positioned a tempting competitor in the form of the LG Watch Urbane, a stylish offering with premium appeal. With both devices launching imminently you might be wondering how these two high-end watches compare, in which case wonder no more, because we have the answers. The LG Watch Urbane has a 1.3-inch circular face, with a fairly sharp 320 x 320 resolution, giving it a pixel density of 245 pixels per inch. While we haven't gone hands on with it yet it should be the same as the LG G Watch R's screen, which is bright and generally impressive. The Apple Watch has a square face, which from an aesthetic perspective immediately puts it at a disadvantage. We know that it comes in a choice of 38mm (1.5 inches) or 42mm (1.65 inches), so it's bigger than the LG Watch Urbane's screen. We also know that it's a sapphire crystal Retina display, though exactly what resolution it is and how high quality it is remains to be seen. The LG Watch Urbane is all about style, that's seemingly its entire purpose since it's basically a G Watch R in a more stylish body. At just 45.5 x 52.2 x 10.9mm it has a thinner profile than the G Watch R so it shouldn't look out of place on either a man's or a woman's wrist. Its full metal body in a gold or silver finish leaves it looking a lot like a high-end wristwatch, especially when combined with a leather strap. The Apple Watch is clad in metal too and it's available in two different sizes - 38mm and 42mm, so whether you've got big or small wrists there should be a model to suit. In fact it's all about customisation, as it also comes in a selection of different colours and materials, with a choice of a stainless steel, silver aluminium, 18-carat yellow gold, 18-carat rose gold, space grey aluminium or space black stainless steel body and a sport band, link bracelet, leather loop, classic buckle, modern buckle and Milanese loop strap. In terms of combinations with straps, there's a whopping 34 options - which we've rounded up here. You get no such choices with the LG Watch Urbane, though as it uses a 22mm strap you can at least change it for any standard strap. Depending on your choices with the Apple Watch it can either look far cheaper than the Watch Urbane or far more expensive. Whether it looks better or worse is somewhat debatable, especially with its square face working against it, but at least you can make it yours. With a 1.2GHz quad-core Snapdragon 400 processor and 512MB of RAM the LG Watch Urbane is a fairly powerful little device and if the equally-specced G Watch R is anything to go by it should offer good, albeit not exceptional performance. The heart of the is a custom-made S1 processor that confines its key specs to a single miniaturized chip. It's an entire computer system on a single chip, which certainly sounds impressive, but it remains to be seen how that will affect performance. Also onboard is what Apple calls its Taptic Engine to initiate haptic feedback that feel like taps on your wrist. Alerts, notifications and friends' conversations all produce a unique vibration. We don't yet know how well the Apple Watch will perform but we'd be surprised if it wasn't quite slick, given that performance is one thing Apple has rarely struggled with.